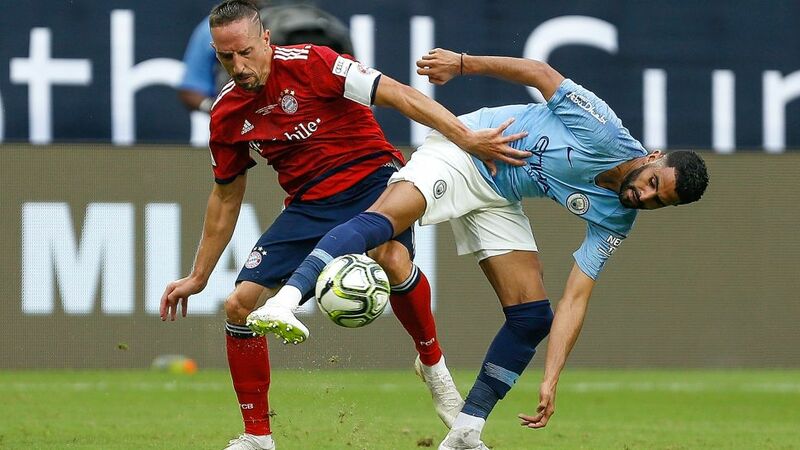 Bayern Munich slipped to a narrow 3-2 defeat to Manchester City in the final International Champions Cup match of their summer tour of the US in Miami on Saturday evening. While the English Premier League champions got off to the brighter start at the Hard Rock Stadium, their eye-catching passing and intense pressing did not create any clear openings. Bayern showed them how it was done with their first meaningful attack when Arjen Robben released Rafinha down the right and his cross was headed in by Meritan Shabani. Niko Kovac's side doubled their advantage moments later when Robben finished superbly past Claudio Bravo. However, just when it looked as if the Bavarians would take a 2-0 lead into the break, Bernardo Silva's sweetly struck shot from the edge of the box reduced the arrears. City carried that momentum into the second half and equalised early on when Lukas Nmecha tapped in the rebound after Ulreich saved Phil Foden's drive from distance. The Citizens, under the watchful eye of former Bayern coach Pep Guardiola, continued to press and took the lead for the first time when Silva's low shot squeezed in at the near post. Bayern rallied after that and Robben in particular was a menacing presence on the right, but ultimately the Bundesliga champions couldn't find the net again. Watch: What James Rodriguez could bring to Kovac's Bayern next season! Guardiola spent three seasons at Bayern between 2013 and 2016, winning the Bundesliga three times and the DFB Cup twice. His 80 percent win ratio remains a record.Renato Sanches’ strike against PSG – a clever free-kick which deceived Remy Descamps at his near post – was his first goal for the club.Sanches is one of 14 teenagers in Bayern’s squad for the ICC. Ribery is the oldest team member in the USA at 35-years-old.Bayern swept to their sixth consecutive Bundesliga title last season, 21 points clear of nearest challengers Schalke. Man City won the English Premier League title with a 19-point gap to second-place Manchester United.Bayern have met City six times in the UEFA Champions League, winning three games apiece. The Bavarians took the spoils the last time they played, though, winning 1-0 in a pre-season friendly in the summer of 2016.As well as Guardiola, City have a number of former Bundesliga players in their ranks, including Sane, Kevin de Bruyne, Ilkay Gündogan and Vincent Kompany. Only the former is at the ICC, though.